Silesia is a historical region in east–central Europe spanning the territory named Magna Germania by Tacitus. It is encircled by the upper and middle Oder (Odra) River, upper Vistula River, and the Sudetes and Carpathian mountain ranges. The largest portion lies within the borders of Poland; the rest is within the Czech Republic and Germany. Slavs arrived in the area around the sixth century and founded Great Moravia. In the Middle Ages, it was divided between numerous independent duchies ruled by the Piast dynasty and exposed to cultural and ethnic Germanization due to immigrants from the Holy Roman Empire from the fourteenth century on, after the Czech king Charles IV of the Luxembourg dynasty became Holy Roman Emperor. By the end of the fifteenth century, due to a succession of disputes and the region's prosperity, there were at least 16 principalities of Silesia. The crown passed to the Habsburg dynasty of Austria in 1526 and was taken by Prussia in 1742 in the War of the Austrian Succession and held on to it until 1945. Following the establishment of independent Poland in 1918, the region was divided between Poland, Czechoslovakia and Germany. During World War II Polish Silesia was occupied by Germany and was the site of atrocities against the population by Nazi and, later, Soviet forces. Following the war, the Allied powers assigned the majority of German Silesia to Poland. The small portion of Silesia retained by Austria is now within the Czech Republic. Nearly one-fourth of Poland's population is contained within Silesia at the beginning of the twenty-first century. Roman Catholicism held sway over Silesia for most of its history, for which, along with the fact that it had a large German population, it was plundered in the Hussite Wars in the fifteenth century. Silesia is a historical region in central Europe spanning the territory named Magna Germania by Tacitus. It is encircled by the upper and middle Oder (Odra) River, upper Vistula River, and the Sudeten and Carpathian mountain ranges. 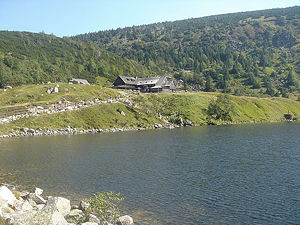 It consists largely of the river basin and is bound by the Kraków-Wielun plateau to the northeast. The largest portion lies within the borders of Poland; the rest is within the Czech Republic (Severomoravský kraj region) and Germany (Brandenburg and Saxony Länder states). Major cities are Wrocław and Katowice. The Opole and Silesian Voivodeships form Upper Silesia. The small portion in the Czech Republic known as Czech Silesia comprises, with the country’s northern part of the Moravia region, the Moravian-Silesian Region, while the remainder makes up a small part of the Olomouc Region. The Niederschlesischer Oberlausitzkreis and Hoyerswerda, along with the Lower Silesian Voivodeship, chart the geographic region of Lower Silesia. Silesia is a populous and resource-rich region, with coal and iron deposits and booming manufacturing. The most important part is its southern tip—Upper Silesia— in Poland. Being one of the largest industrial concentrations of Europe, it has extensive coal and lignite deposits as well as zinc, lead, and iron. Czech Silesia comprises the Karvinna coal basin. Lower Silesia boasts the largest copper deposits in Poland. The fall of Communism, however, has brought to light obsolete facilities that inevitably pose environmental problems. Except in the south, Silesia is largely agricultural and forested lowland, drained by the Oder and its tributaries. One source attributes the origin of the name Silesia to the Silingi, who were most likely a Vandalic (East Germanic) people presumably living south of the Baltic Sea along the Elbe, Oder, and Vistula Rivers in the second century. When the Silingi moved out during the Migration Period, they left remnants of their society behind, the most obvious being the names of places imposed by the new inhabitants, Slavic peoples. These people became associated with the location and subsequently became known as Silesians (using a Latinized form of the Polish name, Ślężanie), although they had little in common with the original Silingi. Archeological research has uncovered formerly largely populated areas from the seventh and eighth centuries, which were protected by a dense system of fortifications to the west and south; the lack of such systems to the north or east supports the hypothesis that Silesia was populated by early Slavic tribes between the fifth and thirteenth centuries. Because Goths, another East Germanic group, were settled in eastern Silesia while Slavic Wends lived in western Silesia, there cannot be any mention of a nation. Another source traces the region’s name to the river Ślęza. Silesia was inhabited by various peoples in the Stone, Bronze, and Iron Ages. The earliest written sources mention Magna Germania in the writings of Ptolemaeus and Germania, as recorded by the Roman historian Tacitus. Tacitus wrote that the first century Silesia was inhabited by a multi-ethnic league dominated by the Lugii, an East Germanic tribe. The Silingi were also part of this grouping, and so were most likely Vandals. Other East Germanic tribes also inhabited the scarcely populated region. Slavic tribes entered the scene around 500 C.E. After 500 C.E. the Great Migration had induced the bulk of the original East Germanic tribes to leave Silesia, while Asian tribes had been arriving for centuries, and Slavic tribes began forming first settlements, including the Silesian lands. Early documents mention several mostly Slavic tribes most probably living in Silesia. The Bavarian Geographer (around 845) specifies five peoples, to which a document of the Bishopric of Prague (1086) adds four others. In the ninth and tenth centuries, the territory to be called Silesia was part of Great Moravia, Moravia, and Bohemia neighboring on the Czech Republic to the south. After the breakup of Great Moravia, Silesia for centuries became a target of protracted disputes and wars mostly between Czech and Polish rulers. Around 990, several parts of Silesia were conquered and annexed to the newly-created Polish state by Duke Mieszko I (see map), although other sources date this event to 999 under the rule of Duke Boleslaus I. The Premyslid Dynasty took over in the tenth century, but by the end of the century, the region was back in the hands of Piasts. The two dynasties vied for the territory until the twelfth century. By the eleventh century, Silesia was an integral part of Poland. King Boleslaus III (1102–1138), of the Piast Dynasty divided Poland into four hereditary duchies, of which Silesia was one, for his sons. After 1200, the duchy of Silesia disintegrated into numerous minor principalities. In 1146, High Duke Władysław II acknowledged supremacy of the Holy Roman Empire, and his two sons in 1163 divided the land between themselves as dukes of Lower and Upper Silesia, creating two main Piast lines, of Wrocław and of Opole and Racibórz. Further division continued under their successors, reaching 16 principalities by the 1390s. In 1241, the Mongols invaded Europe—and Silesia—and sowed panic, looting much of the region and annihilating the combined Polish and German forces in the Battle of Legnica. Upon the death of Ögedei Khan, they chose not to press further into Europe and left, leaving Silesia to further disintegrate until it counted almost 20 small administrative units and invited attempts at annexation by the Premyslid Dynasty, focused primarily on Upper Silesia. The ruling Silesian lords rebuilt some 160 cities and 1,500 towns and restored the most recent administrative divisions, while at the same time introducing the codified German city law in place of the customary Slavic and Polish laws. They also made up for the recent population loss by inviting new settlers, mostly German and Dutch colonists from the Holy Roman Empire. Germans settled mostly in cities, as did Jews and some Czechs. In the countryside, especially in Upper Silesia, people of Polish origins still outnumbered the rest of the population. The Germans quickly rose to prominent positions in the economic life, although this policy of inviting Germans to colonize and cultivate the barren lands as well as the assimilation of the ruling classes by the German and Slavic inhabitants, would fuel ideological and nationalist tensions between the Poles and Germans in the nineteenth century and the first half of the twentieth century. In the second half of the thirteenth century, various knightly orders arrived. Czech king Wenceslas II of the Luxembourg dynasty ascended to the Polish throne in 1300 and annexed most of Lower Silesia to the Kingdom of Bohemia. King John expanded the possessions, which were acknowledged by the Polish king in 1335 in exchange for the Luxembourg Dynasty’s abandonment of their claims on the Polish throne. His son, Charles IV, who was crowned as the Holy Roman Emperor, incorporated Silesian duchies into the Czech lands, thus the Silesian princes became princes of the Holy Roman Empire in the early fourteenth century. During the Hussite Wars in the fifteenth century, Silesia was temporarily detached from the Bohemian crown and ruled by Hungary. In 1490, however, both Silesia and Moravia reverted to Bohemia, with which they passed to the House of Habsburg in 1526. In the time of divisions, Piast dukes sought to reincorporate Silesia into the Polish kingdom and reunite the country, the first being Duke Henryk IV Probus of Silesia, but he died in 1290 before realizing his goal. Duke Przemysł II of Greater Poland united two of the original provinces and went on to become king in 1295, but he was murdered a year later before being able to accomplish more. In 1302, the self-appointment by King Wenceslaus II Luxembourg of Bohemia as King of Poland spurred 50 years of wars between Władysław and his son Casimir III the Great and a coalition of Bohemians, Brandenburgers and Teutonic Knights, who sought to divide Poland. Since most Silesian dukes controlled small chunks of the territory, they lacked the clout to unite with Poland and thus fell under the influence of neighboring Bohemia. In 1335 Duke Henry VI of Breslau and the Upper Silesian dukes recognized the overlordship of King John I Luxembourg of Bohemia, and in 1348 King Casimir III of Poland had no choice but to turn over most of Silesia to Bohemia, ruled by Holy Roman Emperor Charles IV. 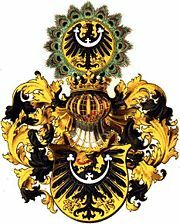 This marked the transition of the duchies of Silesia into the Holy Roman Empire. Breslau in particular benefited from these developments, with a number of large Gothic buildings and churches being built. 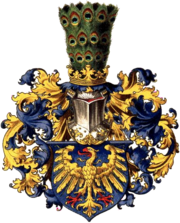 Over the following centuries the lines of the Piast dukes of Silesia died out and were inherited by the Bohemian crown. By the end of the fourteenth century, Silesia had been fragmented into 18 principalities, whose rulers gave in to internecine quarrels and failed to curb the lawlessness of their feudal vassals. Except for several Lower Silesia principalities, the country fell into a state of crippling anarchy. From the thirteenth century onward, the population became increasingly Germanized with the influx of German settlers and assimilation of local rulers and peasants within this new German majority. During the Hussite Wars named for the followers of Jan Hus in Bohemia, Silesia was loyal to Catholicism, with an exception of Cieszyn Silesia. However, the region’s allegiance to Bohemia’s Catholic King Sigismund Luxembourg and an active role of Silesian dukes in the first two crusades against the Hussite Bohemia brought about a series of devastating Hussite invasions between 1425 and 1435. The Silesians regarded Bohemian rebels as dangerous to the Silesian German nationality; indeed, the Hussites targeted the German population during their raids in the region. Many of towns gave in without resistance. Some regions, particularly Upper Silesia, re-introduced the Slavic language. This period lasted until the Battle of Lipany in 1434, after which the Hussites withdrew. Sigismund was succeeded by the Hussite George of Podebrady (Jiří z Poděbrad) in 1457, intensifying fears of the restitution of the Slavonic nationality, and Silesian dukes, most notably the burghers of Breslau, refused to recognize him as their king, accepting Hungarian King Matthias Corvinus in 1469 instead. In the late 1470s, George’s successor and Matthias Corvinus divided up Silesia – Moravia, Silesia and Luzice went to Matthias, while the entire Kingdom of Bohemia was transferred over to Vladislaus Jagellon. Both used the title of the Czech king. Matthias to a large extent centralized Silesian administration, resorting to mercenaries and land grabs from dissenting nobles. However, the reforms did not placate Silesian worries and resentment stemming from Matthias’ financial tactics, and after his death the region returned to the Czech Crown. During the rule of Matthias’s feeble successor Vladislaus Jagellon, Silesia managed to secure virtual autonomy. A turnabout came with the rule of the German king Ferdinand I, who had been previously occupied with wars with the Turks. He reasserted control of the Bohemian Crown by abolishing all of its privileges and imposed a more rigid centralized government. The Bohemian rulers continued to claim further territory after the extinction of Silesian dynasties as the surviving princes watched helplessly. By 1550 Silesia was almost completely under foreign administration but continued to enjoy economic ties with the neighboring Kingdom of Poland during the Renaissance period and beyond, especially through the Jewish merchants in the cities. The Protestant Reformation of the sixteenth century took an early hold in Silesia, with most inhabitants converting to Lutheranism. At the same time, pastors aided the renaissance of the Slavic culture and language. In 1526, Ferdinand I of the Habsburg dynasty was elected King of Bohemia, and in the same year he incorporated the Bohemian Kingdom into the dynasty. This was yet another period of heightened Germanization and weakening of the region’s ties with Poland. The religious conflicts and wars of the Reformation and Counter Reformation throughout the seventeenth century drove scores of Silesian Protestants to seek refuge in the tolerant Polish-Lithuanian Commonwealth. Thousands settled in the province of Greater Poland, under the protection of powerful Protestant magnates. Members of the Czech Brethren, under the leadership of John Amos Comenius, settled in Leszno. To circumvent stringent laws, Protestant Silesians built churches on the Polish side of the border. The tensions between Catholics and Protestants boiled over at the turn of sixteenth and seventeenth centuries. Protestant estates took advantage of the protracted disputes between Rudolf II and his brother Matthias, securing religious freedom in 1609 for both the Czech lands and Silesia. The Thirty Years' War (1618–1648), sparked by the second Defenestration of Prague in 1618 in the wake of Ferdinand II, Holy Roman Emperor's attempts to restore Catholicism and stamp out Protestantism in Bohemia, brought untold misery to Silesia under successive Saxon, imperial, and Swedish occupation. Ferdinand II did not receive assistance from the mostly Catholic Polish-Lithuanian Commonwealth; the Polish dukes leaned toward the Bohemian and Hungarian nobility and defied Polish King Sigismund III Vasa's attempt to assist the Habsburgs. Sigismund III Vasa thus dispatched an unemployed mercenary group, the Lisowczycy, in late 1619, hoping to regain parts of Silesia in exchange for assisting the Habsburgs. The Lisowczycy's support would prove decisive during the 1620 Battle of the White Mountain, in which Czech estates were defeated. However, as the Habsburg outlooks became favorable, Ferdinand II abandoned plans to grant concessions to Silesia, nor did he come to the side of Poland embroiled in the war against the Ottoman Empire. The Polish kings never received more than vague promises and several brides to keep them favorably inclined toward the Habsburg dynasty. Silesia went to Austrian control with the 1648 Treaty of Westphalia, which ended the Thirty Years’ War. The Habsburgs encouraged Catholicism and succeeded in reconverting 60 percent of the population of Silesia, with massive assistance of Jesuits, who funded schools for the privileged and non-privileged classes alike. Lutheranism was tolerated in Breslau and a few other districts; nevertheless, Protestants were able to erect a mere three churches, which were built of wood, devoid of spires, and outside municipal fortifications. In 1675, the death of the last Piast compelled Austria to incorporate the Piast territories into Bohemia. Empress Maria Theresa heralded the region's last years under the Kingdom of Bohemia. King Frederick II, as the heir of the house of Brandenburg, in 1740 claimed a portion of Silesia from her, which was welcomed not only by Protestants and Germans but also by many Silesians. Maria Theresa granted him Lower Silesia in a secret pact in exchange for a neutral stance in the Habsburg conflicts with Saxony, Bavaria, and France. However, in November of 1741, Frederick II switched allegiance and joined the anti-Habsburg coalition, which cost the Habsburgs most of Silesia in favor of Prussia. In the War of the Austrian Succession (1740-1748), the Kingdom of Prussia had conquered almost all of Silesia, and only the southeastern tip remained under the Habsburg monarchy. The Silesian Wars (1740–1742 and 1744–1745) were fought as part of the War of the Austrian Succession. The Seven Years' War (1756-1763) confirmed Prussian control over most of Silesia. After the Napoleonic Wars in 1815, German language became one of choice in Lower Silesia, whereas Polish and Czech dialects were spoken in the countryside of Upper Silesia. German was the common language in the majority of Silesian cities. As a Prussian province, Silesia became part of the German Empire during the unification of Germany in 1871. Upper Silesia became target for migration during the industrialization period. The overwhelming majority of the population of Lower Silesia was by then German-speaking and many were Lutheran, while rural Upper Silesia spoke mostly Slavic languages and adhered to Roman Catholicism. 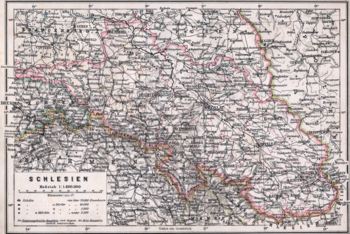 Many Poles were headed to Germany via Silesia to escape the volatile Russian-Polish belt. During the Industrial Revolution, textile weaving and coal mining flourished, albeit amid social tensions that were polarized along ethnic groups. The upper and middle classes were predominantly German; the workers were mostly Polish. Work conditions gradually improved, although Silesia remained a relatively backward area even in the twentieth century despite high productivity. At the same time, the areas of Ostrava and Karvina in Austrian Silesia became increasingly industrialized, with Slavic Lutherans prevalent. In 1900 the population numbered 680,422, with Germans accounting for 44.69 percent, Poles representing 33.21 percent, and Czechs and other Slavs making up 22.05 percent. Some 84 percent were Roman Catholics, 14 percent Protestants, and the remainder were Jews. 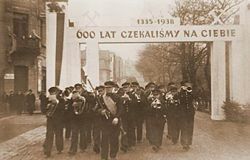 Military band walks under the sign made by Polish people of Karwina during the 1938 annexation of Zaolzie by Poland. The sign reads "We've been waiting for you 600 years". The Treaty of Versailles (1919) granted the population of Upper Silesia a right to determine their future, with the exception of a 333 km² area with German majority around Hlučín that was granted to Czechoslovakia in 1920, but the Czechoslovak government did not endorse the proposed division and invaded Cieszyn Silesia in 1919, stopping on the Vistula River near Skoczów. The planned plebiscite was not held, and the border between Poland and the Czech Republic was decided in 1920 by the Ambassadors' Council at the Treaty of Versailles. The delineation of the rest of the region was accomplished in the 1921 plebiscite whose outcome was in favor of Germany except the easternmost Upper Silesia, predominantly Polish, where an armed conflict in 1922 compelled the League of Nations to grant the larger part of the industrial district, including Katowice, to Poland. The contested Teschen district was partitioned in 1920 between Poland and Czechoslovakia to the satisfaction of neither. The boundaries often cut through mines; some workers slept in one country and worked in another. The Munich Treason of 1938 divided most of Czech Silesia between Germany and Poland, and after the German conquest of Poland in 1939, the entire Polish Silesia was annexed to Germany. The local German population showed support of the fascist regime, and numerous concentration camps were constructed throughout Silesia. "Freedom for Silesia" - political poster from the Territorial Association of Silesia of Silesian Germans expelled by Poland after 1945. Under Adolf Hitler, the German Third Reich retook possession of the predominately Polish sections of Upper Silesia along with Sosnowiec (Sosnowitz), Będzin (Bendzin, Bendsburg), Chrzanów (Krenau), and Zawiercie (Warthenau) counties and parts of Olkusz (Ilkenau) and Zywiec (Saybusch) counties in September 1939, when the invasion of Poland marked the beginning of World War II. The local German populations frequently welcomed the Wehrmacht. In 1940 the Germans began construction of the Auschwitz concentration camp, which was later used as a death camp during the Holocaust. The Gross-Rosen concentration camp, which had subcamps in many Silesian cities, was also constructed in 1940. The Riese Project was later implemented, during which thousands of prisoners died. In 1945, Silesia was occupied by the Soviet Red Army and the Communist Polish Army. By then a large portion of the German population were expelled or had fled for fear of retribution by Soviet soldiers, but many returned after Germany's capitulation. Under the terms of the Yalta Conference agreements held in 1944 and the Potsdam Agreement of 1945, German Silesia east of the rivers Oder and Lusatian Neisse was granted to Poland, and most of the remaining Silesian Germans, who before World War II amounted to more than four million, were displaced or sent to labor camps. Over 30,000 men were deported to Soviet mines and Siberia. The section of the region formerly controlled by Prussia was placed under Polish administration, with the German population likewise forced to leave. After the fall of Communism, local industry was rebuilt and the region repopulated by Poles. For administrative purposes, Silesia was divided into nine districts and three cities with autonomous municipalities Troppau, the capital, Bielitz, and Friedek. Silesia is inhabited mostly by Poles and Silesians, followed by German, Czech, and Moravian minorities. Poland’s 2002 census found that the Slavic Silesians are the largest ethnic minority in Poland, trailed by Germans — both reside mostly in Upper Silesia. The Czech part of Silesia is inhabited by Czechs, Moravians, and Poles. For comparison, the 1905 census showed that 75 percent of the population was German and 25 percent Polish. The vast majority of German Silesians either fled Silesia or were expelled during and after World War II and now live in the Federal Republic of Germany, many are employed in the mines of the Ruhr area, as were their ancestors in Silesian mines. 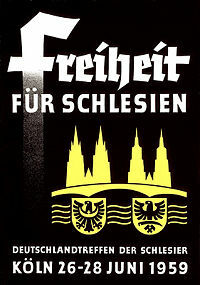 In order to facilitate their integration into West German society after 1945, the West German government established and sponsored various organizations. Wrocław Breslau 635 932 293 km² Lower Silesian V.
Ostrava Ostrau 309 531 214 km² Moravian-Silesian R.
11 File:POL Wałbrzych COA.svg Wałbrzych Waldenburg 126 465 85 km² Lower Silesian V.
Legnica Liegnitz 105 750 56 km² Lower Silesian V.
"Republic of Silesia" REPUBLIKA S'LOONSKO. "Historical Map of Silesia 1763" Thomas Höckmann Website. Willkommen im Schlesischen Museum! Silesian Museum Website. Ruch Autonomi Slaska Silesian Autonomy Movement.